Now that school is almost out and summer is quickly approaching, there’s no better time to break out the shorts, t-shirts, and flip-flops. For this week only, you can customize t-shirts for your new grads, proud fathers, summer sports teams, or even the whole family! Choose from over 2,000 cute designs (or design your own from scratch!) to create the perfect, personal gift for a baby shower, family reunion BBQ, wedding party, or our annual Fourth of July cookout. 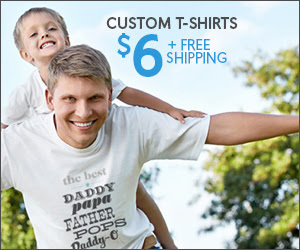 Just upload your favorite pictures, customize the text and colors, and let your creative juices flow because basic t-shirts are only $6 shipped for a limited time!